Edible mushrooms are consumed for their nutritional value and for their culinary value. Mushrooms consumed by those practicing folk medicine are known as medicinal mushrooms. While psychedelic mushrooms are occasionally consumed for recreational or entheogenic purposes, they can produce psychological effects, and are therefore not commonly used as food. There is no evidence from high-quality clinical research that 'medicinal' mushrooms have any effect on human diseases. Edible mushrooms include many fungal species that are either harvested wild or cultivated. 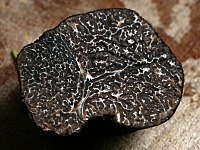 Easily cultivated and common wild mushrooms are often available in markets, and those that are more difficult to obtain (such as the prized truffle, matsutake and morel) may be collected on a smaller scale by private gatherers. Some preparations may render certain poisonous mushrooms fit for consumption. Before assuming that any wild mushroom is edible, it should be identified. Accurate determination and proper identification of a species is the only safe way to ensure edibility, and the only safeguard against possible accident. Some mushrooms that are edible for most people can cause allergic reactions in some individuals, and old or improperly stored specimens can cause food poisoning. Great care should therefore be taken when eating any fungus for the first time, and only small quantities should be consumed in case of individual allergies. Deadly poisonous mushrooms that are frequently confused with edible mushrooms and responsible for many fatal poisonings include several species of the genus Amanita, in particular, Amanita phalloides, the death cap. It is therefore better to eat only a few, easily recognizable species, than to experiment indiscriminately. Moreover, even normally edible species of mushrooms may be dangerous, as mushrooms growing in polluted locations can accumulate pollutants such as heavy metals. Mycophagy /maɪˈkɒfədʒi/, the act of consuming mushrooms, dates back to ancient times. Edible mushroom species have been found in association with 13,000-year-old archaeological sites in Chile. Ötzi, the mummy of a man who lived between 3400 and 3100 BCE in Europe, was found with two types of mushroom. 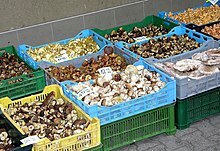 The Chinese value mushrooms for supposed medicinal properties as well as for food. Ancient Romans and Greeks, particularly the upper classes, used mushrooms for culinary purposes. Food tasters were employed by Roman emperors to ensure that mushrooms were safe to eat. Mushroom cultivation has a long history, with over twenty species commercially cultivated. Mushrooms are cultivated in at least 60 countries with China, the United States, Netherlands, France and Poland being the top five producers in 2000. A fraction of the many fungi consumed by humans are currently cultivated and sold commercially. Commercial cultivation is important ecologically, as there have been concerns of depletion of larger fungi such as chanterelles in Europe, possibly because the group has grown popular, yet remains a challenge to cultivate. Agaricus bisporus dominates the edible mushroom market in North America and Europe, in several forms. It is an edible basidiomycete mushroom native to grasslands in Europe and North America. As it ages, this mushroom turns from small, white and smooth to large and light brown. In its youngest form, it is known as the 'common mushroom', 'button mushroom', 'cultivated mushroom', and 'champignon mushroom'. Its fully mature form is known as 'portobello'. Its semi-mature form is known variously as 'cremini', 'baby-bella', 'Swiss brown' mushroom, 'Roman brown' mushroom, 'Italian brown' mushroom, or 'chestnut' mushroom. Pleurotus and in particular Pleurotus ostreatus, the 'Oyster mushrooms', are among the most common in the Asian market. Lentinula edodes, the Shiitake mushroom, also common in the Asian market. Auricularia auricula-judae, the Jew's ear, wood ear, or jelly ear mushroom. Volvariella volvacea, the paddy straw mushroom or straw mushroom. Flammulina velutipes, the enoki mushroom, golden needle mushroom, seafood mushroom, lily mushroom, winter mushroom, velvet foot, velvet shank, or velvet stem. Tremella fuciformis, the snow fungus, snow ear, silver ear fungus, and white jelly mushroom. Hypsizygus tessellatus, aka Hypsizygus marmoreus, the beech mushroom, also known in its white and brown varieties as Bunapi-shimeji and Buna-shimeji, respectively. Stropharia rugosoannulata, the wine cap mushroom, burgundy mushroom, garden giant mushroom, or king stropharia. Cyclocybe aegerita, the pioppino, velvet pioppini, poplar, or black poplar mushroom. Hericium erinaceus, the lion's mane, monkey head, bearded tooth, satyr's beard, bearded hedgehog, or pom pom mushroom. Boletus edulis or edible Boletus, native to Europe, known in Italian as fungo porcino (plural 'porcini') (pig mushroom), in German as Steinpilz (stone mushroom), in Russian as Russian: Белый гриб, tr. Bely grib (white mushroom), in Albanian as (wolf mushroom), in French as the cèpe and in the UK as the penny bun. It also known as the king bolete, and is renowned for its delicious flavor. It is sought after worldwide, and can be found in a variety of culinary dishes. 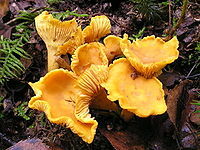 Cantharellus cibarius (The chanterelle), The yellow chanterelle is one of the best and most easily recognizable mushrooms, and can be found in Asia, Europe, North America and Australia. There are poisonous mushrooms which resemble it, though these can be confidently distinguished if one is familiar with the chanterelle's identifying features. Grifola frondosa, known in Japan as maitake (also "hen of the woods" or "sheep’s head"), a large, hearty mushroom commonly found on or near stumps and bases of oak trees, and believed to have Macrolepiota procera properties. Gyromitra esculenta, this "false morel" is prized by the Finns. This mushroom is deadly poisonous if eaten raw, but highly regarded when parboiled (see below). Hericium erinaceus, a tooth fungus; also called "lion's mane mushroom"
Morchella species, (morel family) morels belong to the ascomycete grouping of fungi. They are usually found in open scrub, woodland or open ground in late spring. When collecting this fungus, care must be taken to distinguish it from the poisonous false morels, including Gyromitra esculenta. The morel must be cooked before eating. Tricholoma matsutake, the matsutake, a mushroom highly prized in Japanese cuisine. Many wild species are consumed around the world. The species which can be identified "in the field" (without use of special chemistry or a microscope) and therefore safely eaten vary widely from country to country, even from region to region. This list is a sampling of lesser-known species that are reported as edible. Calocybe gambosa (St George's mushroom). Chroogomphus rutilus (pine-spikes or spike-caps). Clavariaceae species (coral fungus family). Clavulinaceae species (coral fungus family). Coprinus comatus, the Shaggy mane, Shaggy Inkcap or Lawyer's Wig. Must be cooked as soon as possible after harvesting or the caps will first turn dark and unappetizing, then deliquesce and turn to ink. Not found in markets for this reason. Fistulina hepatica (beefsteak polypore or the ox tongue). Flammulina velutipes (Velvet Shank or Winter Fungus). Laetiporus sulphureus (Sulphur shelf). Also known by names such as the "chicken mushroom", "chicken fungus", the sulphur shelf is a distinct bracket fungus popular among mushroom hunters. Leccinum aurantiacum (Red-capped scaber stalk). Leccinum versipelle (Orange Birch Bolete / Boletus testaceoscaber). Macrolepiota procera (Parasol Mushroom). Globally, it is widespread in temperate regions. Marasmius oreades (Fairy Ring Champignon). Polyporus squamosus (Dryad's saddle and Pheasant's back mushroom). Ramariaceae species (coral fungus family). Russula, some members of this genus, such as R. laeta, are edible. Sparassis crispa. Also known as "cauliflower mushroom". Amanita fulva (Tawny Grisette) must be cooked before eating. Amanita muscaria is edible if parboiled to leach out toxins, fresh mushrooms cause vomiting, twitching, drowsiness, and hallucinations due to the presence of muscimol. Although present in A. muscaria, ibotenic acid is not in high enough concentration to produce any physical or psychological effects unless massive amounts are ingested. Amanita rubescens (The Blusher) must be cooked before eating. Coprinopsis atramentaria is edible without special preparation, however, consumption with alcohol is toxic due to the presence of coprine. Some other Coprinus spp. share this property. Gyromitra esculenta is eaten by some after it has been parboiled, however, mycologists do not recommend it. Raw Gyromitra are toxic due to the presence of gyromitrin, and it is not known whether all of the toxin can be removed by parboiling. Lactarius spp. Apart from Lactarius deliciosus, which is universally considered edible, other Lactarius spp. that are considered toxic elsewhere in the world are eaten in some Eastern European countries and Russia after pickling or parboiling. Lepista nuda (Wood Blewit) must be cooked before eating. Lepista saeva (Field Blewit, Blue Leg, or Tricholoma personatum) must be cooked before eating. Morchella esculenta (Morel) must be cooked before eating. Verpa bohemica is considered choice by some—it even can be found for sale as a "morel"—but cases of toxicity have been reported. Verpas contain toxins similar to gyromitrin and similar precautions apply. 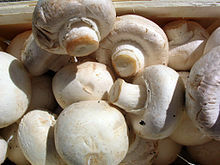 A commonly eaten mushroom is the white mushroom (Agaricus bisporus). In a 100 gram reference amount, Agaricus mushrooms provide 22 calories and are 92% water, 3% carbohydrates, 3% protein, and 0.3% fat (table). They contain high levels (20% or more of the Daily Value, DV) of riboflavin, niacin, and pantothenic acid (24–33% DV), with moderate content of phosphorus (table). Otherwise, raw white mushrooms generally have low amounts of essential nutrients (table). Although cooking (by boiling) lowers mushroom water content only 1%, the contents per 100 grams for several nutrients increase appreciably, especially for dietary minerals (table for boiled mushrooms). The content of vitamin D is absent or low unless mushrooms are exposed to sunlight or purposely treated with artificial ultraviolet light (see below), even after harvesting and processed into dry powder. Mushrooms exposed to ultraviolet (UV) light produce vitamin D2 before or after harvest by converting ergosterol, a chemical found in large concentrations in mushrooms, to vitamin D2. This is similar to the reaction in humans, where vitamin D3 is synthesized after exposure to sunlight. Testing showed an hour of UV light exposure before harvesting made a serving of mushrooms contain twice the U.S. Food and Drug Administration's daily recommendation of vitamin D, and 5 minutes of artificial UV light exposure after harvesting made a serving of mushrooms contain four times the FDA's daily recommendation of vitamin D. Analysis also demonstrated that natural sunlight produced vitamin D2. The ergocalciferol, vitamin D2, in UV-irradiated mushrooms is not the same form of vitamin D as is produced by UV-irradiation of human skin or animal skin, fur, or feathers (cholecalciferol, vitamin D3). Although vitamin D2 clearly has vitamin D activity in humans and is widely used in food fortification and in nutritional supplements, vitamin D3 is more commonly used in dairy and cereal products. Medicinal mushrooms are mushrooms or extracts from mushrooms that are thought to be treatments for diseases, yet remain unconfirmed in mainstream science and medicine, and so are not approved as drugs or medical treatments. Such use of mushrooms therefore falls into the domain of traditional medicine for which there is no high-quality clinical evidence of efficacy. Preliminary research on mushroom extracts has been conducted to determine if anti-disease properties exist, such as for polysaccharide-K or lentinan. Some extracts have widespread use in Japan, Korea and China, as potential adjuvants to radiation treatments and chemotherapy. As of 2019, there is no evidence that consuming mushrooms or mushroom extracts has any effect on human diseases. Lingzhi, a well-known mushroom (Ganoderma lucidum), also called "Reishi"
Some wild species are toxic, or at least indigestible, when raw. The safety of consuming Reishi mushrooms has not been adequately demonstrated, as of 2019. Reishi mushrooms may cause side effects including dryness of the mouth or throat, itchiness, rash, stomach upset, diarrhea, headache, or allergic reactions. Failure to identify poisonous mushrooms and confusing them with edible ones has resulted in death. ^ Chang, Shu-Ting; Phillip G. Miles (1989). Mushrooms: cultivation, nutritional value, medicinal effect, and Environmental Impact. CRC Press. pp. 4–6. ISBN 978-0-8493-1043-0. ^ Arora D (1986). Mushrooms demystified. Ten Speed Press. p. 23. ISBN 978-0-89815-169-5. ^ a b Boa E. (2004). Wild Edible Fungi: A Global Overview of their Use and Importance to People. Food and Agriculture Organization of the United Nations. ISBN 978-92-5-105157-3. ^ Kalač, Pavel; Svoboda, Lubomı́r (15 May 2000). "A review of trace element concentrations in edible mushrooms". Food Chemistry. 69 (3): 273–281. doi:10.1016/S0308-8146(99)00264-2. ^ Jordan P. (2006). Field Guide to Edible Mushrooms of Britain and Europe. New Holland Publishers. p. 10. ISBN 978-1-84537-419-8. ^ John Fereira. "U.S. Mushroom Industry". Usda.mannlib.cornell.edu. Retrieved 2010-05-30. ^ "Every Type Of Mushroom You Need To Know About". Huffingtonpost.com. 19 March 2014. Retrieved 23 October 2018. ^ "Common Types of Mushrooms". Realsimple.com. Retrieved 23 October 2018. 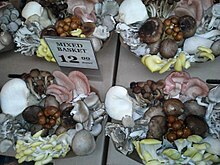 ^ "What's the Difference Between Cremini and Portobello Mushrooms?". Thekitchen.com. Retrieved 23 October 2018. ^ a b c "Cultivation of Oyster Mushrooms". Extension.psu.edu. Retrieved 23 October 2018. ^ T. mesenterium was first reported in Great Britain after the wet August 2008: "New fungi species unearthed in UK". BBC News. 9 October 2008. Retrieved 9 October 2008. ^ Rubel W, Arora D (2008). "A study of cultural bias in field guide determinations of mushroom edibility using the iconic mushroom, Amanita muscaria, as an example" (PDF). Economic Botany. 62 (3): 223–43. doi:10.1007/s12231-008-9040-9. Archived from the original (PDF) on 2012-04-15. ^ a b c Bowerman S (March 31, 2008). "If mushrooms see the light". Los Angeles Times. ^ a b c Koyyalamudi SR, Jeong SC, Song CH, Cho KY, Pang G (April 2009). "Vitamin D2 formation and bioavailability from Agaricus bisporus button mushrooms treated with ultraviolet irradiation". J Agric Food Chem. 57 (8): 3351–5. doi:10.1021/jf803908q. PMID 19281276. ^ Kalaras MD, Beelman RB, Holick MF, Elias RJ (2012). "Generation of potentially bioactive ergosterol-derived products following pulsed ultraviolet light exposure of mushrooms (Agaricus bisporus)". Food Chem. 135 (2): 396–401. doi:10.1016/j.foodchem.2012.04.132. PMID 22868105. ^ Sullivan R, Smith JE, Rowan NJ (2006). "Medicinal mushrooms and cancer therapy: translating a traditional practice into Western medicine". Perspect Biol Med. 49 (2): 159–70. doi:10.1353/pbm.2006.0034. PMID 16702701. ^ Hobbs CJ. (1995). Medicinal Mushrooms: An Exploration of Tradition, Healing & Culture. Portland, Oregon: Culinary Arts Ltd. p. 20. ISBN 978-1-884360-01-5. ^ a b c d "Reishi mushroom". MedlinePlus, US National Library of Medicine. 19 January 2019. Retrieved 24 January 2019. ^ a b Money, Nicholas P. (2016). "Are mushrooms medicinal?". Fungal Biology. 120 (4): 449–453. doi:10.1016/j.funbio.2016.01.006. ISSN 1878-6146. PMID 27020147. ^ "Coriolus versicolor". About Herbs, Botanicals & Other Products. Memorial Sloan-Kettering Cancer Center. 3 October 2018. Retrieved 24 January 2019. ^ "Lentinan (Shiitake)". Memorial Sloan Kettering Cancer Center, New York. 2017. Retrieved 11 January 2017. ^ Sullivan, Richard; Smith, John E.; Rowan, Neil J. (2006). "Medicinal Mushrooms and Cancer Therapy: translating a traditional practice into Western medicine". Perspectives in Biology and Medicine. 49 (2): 159–70. doi:10.1353/pbm.2006.0034. PMID 16702701. ^ Borchers, A. T.; Krishnamurthy, A.; Keen, C. L.; Meyers, F. J.; Gershwin, M. E. (2008). "The Immunobiology of Mushrooms". Experimental Biology and Medicine. 233 (3): 259–76. CiteSeerX 10.1.1.546.3528. doi:10.3181/0708-MR-227. PMID 18296732. ^ a b "Wild Mushroom Warning. Mushroom Poisoning: Don't Invite "The Death Angel" to Dinner". US National Capital Poison Center, Washington, DC. 2017. Retrieved 11 January 2017. ^ Barbee G, Berry-Cabán C, Barry J, Borys D, Ward J, Salyer S (2009). "Analysis of mushroom exposures in Texas requiring hospitalization, 2005–2006". Journal of Medical Toxicology. 5 (2): 59–62. doi:10.1007/BF03161087. PMC 3550325. PMID 19415588. ^ Osborne, Tegan. "Deadly death cap mushrooms found in Canberra's inner-south as season begins early". ABC News. Retrieved 2 May 2016. ^ "Food and Agriculture Organization of the United States". Faostat3.fao.org. Retrieved 23 October 2018. Wikimedia Commons has media related to Edible mushrooms. "Mushrooms" . The New Student's Reference Work . 1914.